I always feel that each of us must choose our own guidance first and to always listen for peace. 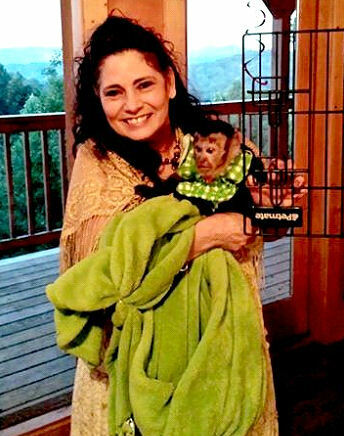 It is a great idea to make plans about what you would do if you were to have your monkey escape or bite someone. I know this is a very hard place for many caregivers to go to in their thoughts, but it is a very important thing to do. When you know what you would do in a monkey emergency, you will automatically put into action those plans because you have gone over them several times. You do not have time to panic, cry, or become angry, when a negative event has taken place. Fear, anger, shock, or crying are not going to help during a crisis. Good solid plans are always the best way to deal with if the above events happen. 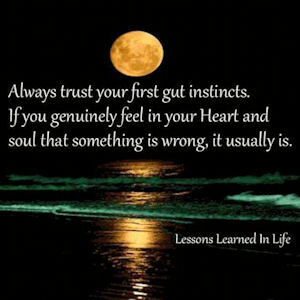 Try with all of your heart and soul to be positive and only believe or say positive things about the event. There is not a place during a time like this for negative thoughts or actions to be spoken or thought about. I am licensed through the USDA and am required to carry my written paper work with me at all times I am out with the monkeys. So, this is an automatic thing with me, but I highly recommend that you choose to carry your written ownership papers, vet check ups and other important information about your monkey with you at all times. Why is it important to carry these important papers with you, Mary Lynn? If a bite or scratch were to happen, you would have proof that your monkey has had the proper shots (such as rabies). This is the first and still the most important thing that you can have done for your monkey in a case like this. 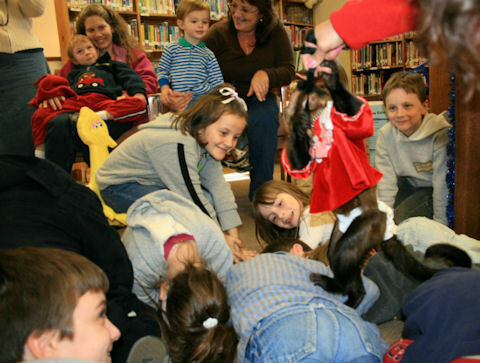 One of the first things a parent or person is going to ask is,”Did you give your monkey a rabies shot?” So, having a record of this being done to your monkey is the first step to making this situation turn out better for you and the monkey. Proper ownership and vet papers will let people see that you are a responsible person if something were to go wrong when you are out with your monkey. Remember to take a crate or box-type cage with you when you go away from home when safety is needed for your monkey. Several years ago, I was at a party and it was time to do the part of the show where Maggie Mae walks on the back of the children. I remember this just like it was yesterday because it was a lesson for both the grandparent of a child and me too! When I came to the child I bypassed him/her instantly because the grandmother was presenting her granddaughter’s back without a proper top for the child to receive a pair of monkey feet. The grandmother said to me instantly, “You did not walk on her back?” I quickly said, ‘She is not properly dressed. She does not have a shirt on.” The lady then said, “It is okay she wants to do it too!” She proceeded to hold the child’s back over for Maggie Mae to walk across her. I did this and then continued to go quickly around the circle of children who were presenting their backs. As you can see I came prepared for the accident. I had the proper documentation and a first-aid kit stocked with a tube of cream that I could share with the grandmother. This is being prepared. This is not jumping to fear. This is not throwing blame at the grandmother or myself. It was an accident that had happened. for the child to experience the monkey on her back even though I had told her my concerns. The event was taken care of quick and easy and we were all fine with the outcome. This was a valuable lesson in using my Safety First attitude and choice of behaviors. Make sure you have your paperwork with you when you take your monkey out of your home. Pack in your “Monkey To Go Bag” a first aid kit with Band-Aids and proper first aid cream and have one handy to pass to someone else if you need to share. Be prepared to keep calm if there is an accident. Be prepared to first take control of your animal and place them in a safe crate or box-type cage as you are repremanding the monkey for what your pre-arranged punishment consists of. Be prepared to go to the person that has been hurt and administer your first aid care. Answer questions after you have done the proper care of both your monkey and the person that is hurt. Stay cool, calm, and in control as much as the other people will allow you to be. Take responsibility for the incident and move quickly to care for the person the best way you can. If others around you during an accident with your monkey are panicking, then please remember that your attitude of being in control and responding quickly can and will make the situation better. Your belief in a positive outcome will help everything go much smoother too. Remember to ask for a miracle instead of worrying about your monkey losing their life because something unfortunate has happened. Many problems can be handled (such as mine) with the event becoming an easy lesson. I would like now to say a “Thank You” to an old friend of mine who shared this plan with me many years ago. Remember to pass this along to others. This plan works and is one that I hope you will never have to use but believe me I was so happy that I had this knowledge and peace of mind when my (easy lesson) came. 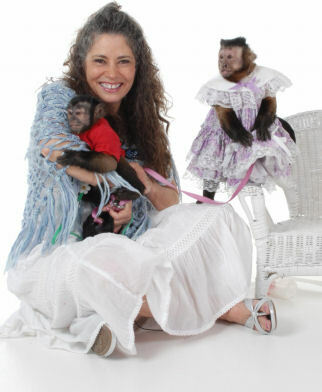 Thank you for visiting us here at Primate Care. We are all committed to bringing good information for you to think about and share with your family, friends, and other monkey caregivers. In next months posting I will be speaking about the next type of event that could happen and that is a monkey being stolen.